Let us embark together on an Independence Day thought experiment. It is tendered in a spirit of amity, respect and good will by an Englishman who loves America. It may be dismissed as the ravings of a deranged colonial sentimentalist, but I am confident you will at least be polite enough to hear me out. It is not hard to understand why America threw off the yoke of British oppression in 1776. The colony had been taxed by a government far, far away without deriving any benefit of representation in its Parliament. At the end of the little unpleasantness that ensued, General Cornwallis surrendered to General Washington and Americans were free of our pettifogging rapacity and incompetent interference, and able to turn toward the construction of a new polity, founded upon a new Constitution. A damned fine stab they made of it, too. For the most part. They incorporated, in many places word for word, the British Parliament’s Bill of Rights of 1689, a farseeing document that limited the powers of the king and laid out for us the lineaments of what was to be Britain’s enduring (and endearing) constitutional monarchy. But they took a further step — a most egregious and regrettable step, as I hope to demonstrate — founded upon a misapprehension of what that Constitution entailed. During the heat of the Revolutionary War, Americans looked — as nations at war always will — for a name and a face to represent the hated foe. The prime minister, Lord North, would have made a colorless and feeble icon of enmity, and so, perhaps naturally, they settled on the person and character of King George. With the word “tyrant” attached permanently to him, America had its slogan, its hate figure. But in fact, George III was far from a tyrant. He was a constitutional monarch with almost no real political power at all. In nearly 60 years, a reign only recently surpassed in longevity by that of the current Elizabeth, he earned the love and respect of his people for his simplicity, kindness, frugality and diligence. The “farmer king” liked nothing better than to wander among his fields, talking happily to peasants, pigs and princes alike, not a tyrannical thought in his amiable, befuddled old mind. But in the New World the wartime propaganda had done its work and the founding fathers had it in their heads that kingship was akin to tyranny and that their new country should be a republic, with an elected president instead of a monarch. The president was to be the highest citizen in the land, executive head of state and commander in chief of the armed forces. That, I submit, was the mistake. If you watched the excellent Netflix series “The Crown,” you will remember those scenes in the first few episodes in which the newly acceded Elizabeth received her prime minister, Winston Churchill. During these weekly audiences, the great political lion had to stand before her, explain the conduct of his administration, outline governmental plans and problems and keep her informed as to the state of the nation before bowing himself backward from the room. Constitutional constraints decreed that she could do no more than “advise and consent.” A powerless monarch, but endued with all the symbolic authority of her nation and its long history. The aura this bestowed apparently caused even Churchill to be nervous and discomfited in her presence. Now for the thought experiment. Select any American president, past or present. Picture a gracious white-columned mansion on a hill outside Washington. In it lives a tall, bony man with shaggy eyebrows and a wispy white beard. He wears a top hat with stars on its band, a cutaway coat of blue broadcloth and red-and-white striped trousers. His name is Uncle Sam and he is America. He embodies the values, history, character, disposition and hopes of the whole country. He has no power to legislate, but he is the first citizen, above politics. Because he is not elected, he has no lobbyists, PACs or special interest groups to placate. Every week, the elected president has to call at Uncle Sam’s mansion, stand before him and explain himself and his administration. Uncle Sam can question him, tell him a story about how another president 20 years back had faced a similar quandary, wonder whether things could be better organized, tut, click and sigh, but Uncle Sam cannot command or forbid. Do you not agree that it would be a very healthy thing for presidents to make such a humble, supplicatory journey every week and be reminded that they serve a bigger idea than power, a nobler entity than a political party or a trending ideology? Perhaps mistakenly we think of theatrical rites and ceremonies like this as primitive throwbacks we can congratulate ourselves on having shaken off. But ritual and pageant, costume and custom are to public life what metaphors are to language; they bring it to life and move it from the abstract to the real. 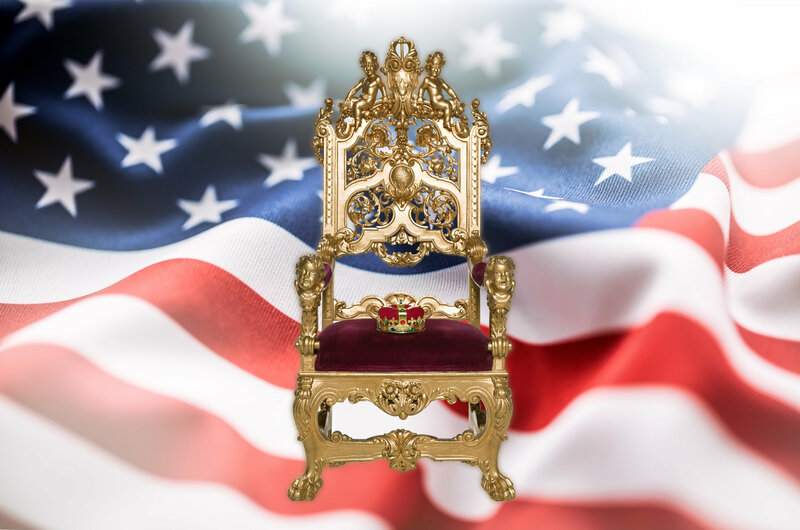 America has an elected executive, but Britain has an elected executive and something else, too: a head of state who stands above the fray, personifying and representing our nation and its history. I am far from claiming that Britain is anything other than a ridiculous country, nor am I denying that there are plenty of Britons who don’t buy into the drama of kingship. Rationally, a monarchy is an absurdity. Of course it is. But we British are not rationalists. We are empiricists and seem always to have been. Looking at 10 Downing Street and the American White House now, I wonder which nation is constitutionally most in danger of allowing a tyrant to arise. My modest proposal on this, America’s great national holiday weekend, is that you choose an Uncle Sam or Aunt Samantha by lottery (which is all the birth of a monarch is) and give this person the powers of a constitutional sovereign, with precedence of state over the elected president. To save face, this person needn’t be called a monarch — “first American” or “sovereign citizen” will do. A reality TV competition can be held to finalize all the details. Americans are awfully good at that sort of thing. Above all, put in your mind the picture of the current president being forced to bow himself backward out of Uncle Sam’s presence. Wouldn’t that just beat the band? And the fireworks, too.